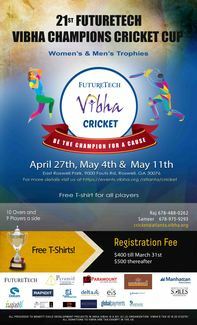 It's time to welcome another joyous spring and with it the much awaited VIBHA Future Tech Cricket Tournament in Atlanta. We will be hosting this year's event on Cricketing Mats at the baseball fields at East Roswell/Waller Parks. The event goes on for three week ends April 27th, May 4th and May 11th. If you would like to help as volunteer during the 3 day event, please sign up for a slot here. Scoring rules can be explained. Game knowledge is needed.